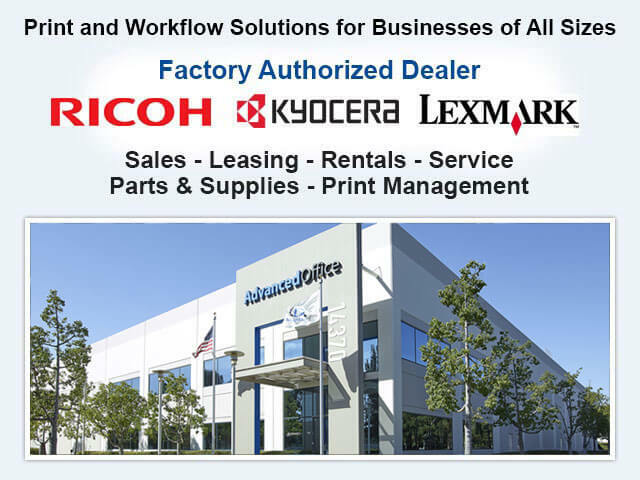 Welcome to Advanced Office, leading authorized dealers for Ricoh and Lexmark serving businesses in Redlands. 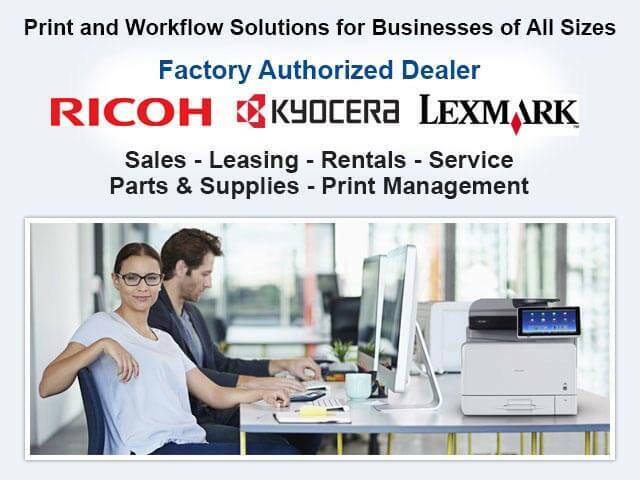 We sell, lease, rent, install, service and maintain Ricoh and Lexmark's impressive line of copiers, printers, production printers, wide-format systems, digital duplicators and fax machines. Additionally, we offer innovative software solutions that facilitate document management, improve workflow systems, and cut print-related costs. Our experts help Redlands companies of all sizes evaluate their office automation needs and find cost-effective ways to meet them. We have more than 30,000 satisfied clients. We have a team of 75+ employees across four Southern California offices. We provide Southern California's best value in copiers and printers. We offer competitive rates and flexible payment options. Our technicians are all factory-trained and certified. We feature a live local dispatch and know our clients by name. We excel at offering superior customer service and completing jobs on the first visit. Call us today and find out what we can do for your Redlands company. With free comprehensive on-site analyses and no obligation to buy, you have nothing to lose. We'll come to your Redlands office and fully analyze your fleet of copiers and printers as well as how your office operates. During this process, we often uncover needs and solutions that are not readily apparent to our clients. 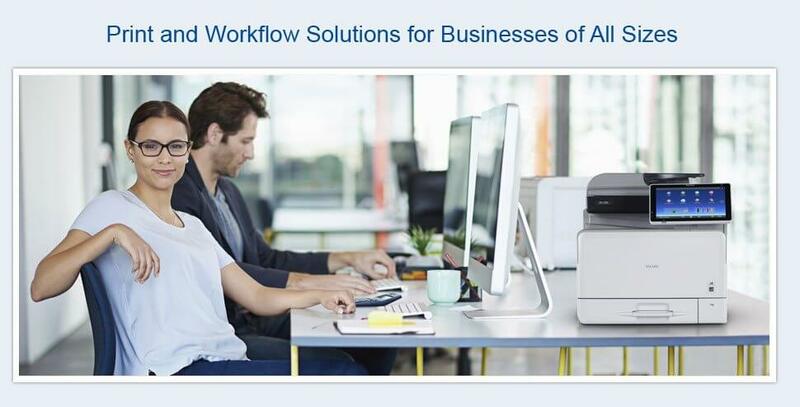 Ricoh and Lexmark set the bar for office technology and provide solutions to workflow and print management challenges that are common among today's businesses. Ricoh is a globally recognized, highly acclaimed leader in quality, reliability and innovation for office automation products. They are currently the leading market shareholder in the U.S. for office technology and account for nearly a quarter of all office technology products sold worldwide. Lexmark has made it its mission to create cost-effective, industry-specific office automation solutions. Their A4 machines offer unmatched speed for their price and footprint, and they have become the preferred choice among 75% of the world's top pharmacies, banks, and retailers. For the last 30 years, Advanced Office has been tremendously focused on our copier sales, leasing, rentals and support because that's what our customers in Redlands and surrounding areas tell us is most important to them. As authorized Ricoh and Lexmark dealers, we are able to provide our Redlands clients with the industry's finest commercial-grade copiers/multifunction devices. Additionally, with our factory-trained and -certified, highly experienced sales consultants, service technicians, and product trainers, we are also able to provide exceptional advice, technical support, product training, and service and maintenance to help them get the most out of these high-performance machines. Call today to have one of our copier specialists visit your site in Redlands. We'll provide a free personalized workflow analysis of your business and determine which copier brand and model best suits your needs; review how copier software can make your business more productive and cost-efficient; and discuss our flexible financing options. Since 1977, the professionals at Advanced Office have rented, leased, sold, installed and serviced Ricoh and Lexmark printers. Our Ricoh and Lexmark printers are available in a wide range of models. We carry low-volume desktop printers, high-volume and high-speed production printers, color printers, black and white printers, and more. Our printers also feature a large variety of features and accessories to suit every business environment. Because our printers rank highly for reliability, durability, print quality, ease of use, functionality, ink yield and value, we focus a lot of our time on finding the right printer for each Redlands business's specific print production needs and budget. Then, we keep your newly acquired printer running optimally and consistently with our unbeatable maintenance and repair services. Call today for a free consultation and estimate. Ricoh's line of production printers includes high-quality wide-format, cutsheet and continuous feed printers capable of handling print and copy jobs of any size and complexity for our Redlands commercial clients. These wide-format, cutsheet and continuous feed printers feature impressive image quality, fast print speeds, full bleed capabilities, and a large array of accessories and production print software options. 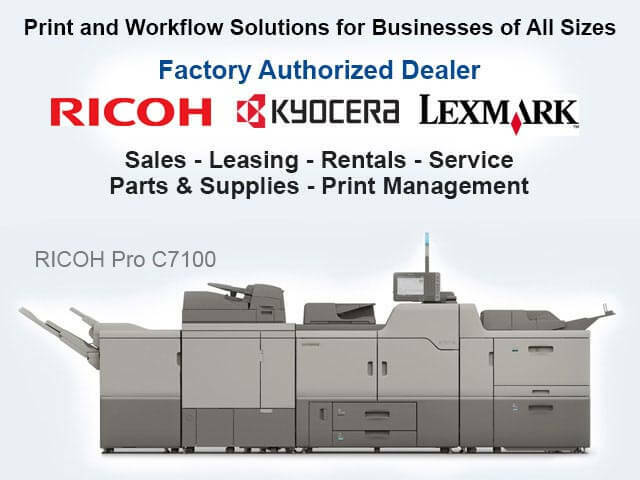 To determine which Ricoh production printer is right for your business, call us today. Our experts average nearly 15 years of industry experience and know how to provide reliable product recommendations to meet the diverse and unique needs of our Redlands clients. Digital duplicators can provide the best copier option for Redlands businesses that frequently produce high volumes of one-page copies. They are usually seen in churches, schools and nonprofit organizations, but can really be used in any type of organization where flyers and handouts need to produced quickly and at the lowest cost possible. 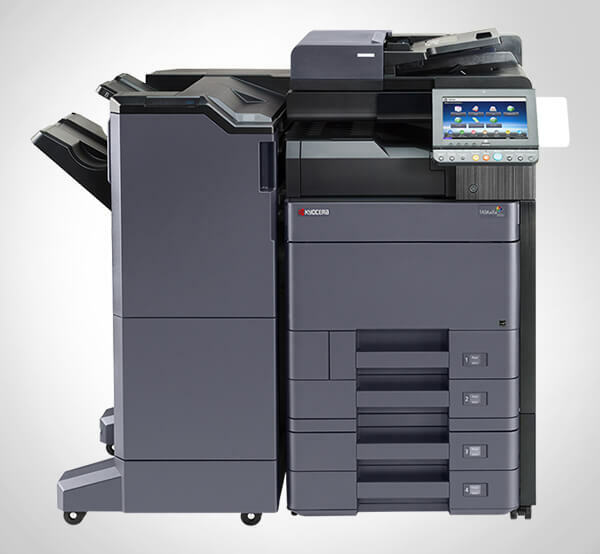 At Advanced Office, we sell and lease competitively priced Ricoh digital duplicators to Redlands area companies. 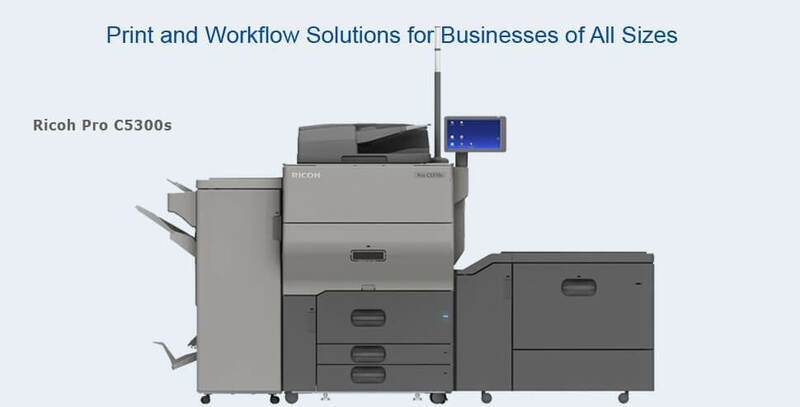 Ricoh's digital duplicators are easy to use, environmentally friendly, incredibly fast (with a copy speed of up to 135 ppm), and highly durable (up to a 15 million page lifecycle). Most importantly, their digital duplicators are extremely cost efficient, printing copies for just a fraction of the cost of a standard black and white copier. At Advanced Office, we proudly offer Redlands businesses Ricoh's full line of fax machines. Their multifunction fax machines range from low-volume desktop models that make it easy to send and receive faxes without leaving your desk, to high-volume production models that can transmit up to 30 pages per minute, handle up to 6,000 pages a month, and store up to 3,000 pages. Ricoh fax machines offer some of the fastest scanning speeds at under four seconds per page and feature all-in-one toner that reduces maintenance costs and increases up time. Call Advanced Office today for a free consultation and estimate. As experts in office automation, Advanced Office has a team of in-house IT specialists who are dedicated to designing and integrating custom software solutions for our Redlands clients. Our software solutions include Ricoh- and Lexmark-compatible document management software, rules-based printing software, scanning software, security software, desktop management software, billing software, electronic content management software, as well as custom-built software. If you are interested in exploring the benefits of print/document management software for your business in Redlands, give us a call. We'll provide you with a free onsite workflow analysis and determine which software solutions will work best for your needs and budget.